Objective: To investigate the psychological status of young doctors’ in hospital for developing health promotion. Methods: Totally 197 doctors were tested and analyzed by using symptom check list (SCL-90). Results: The total mean score of the young doctors was 183.7 ± 20.81. The number of positive items of the young doctors was 37.69 ± 13.17, significantly higher than that of the Chinese population norms (24.91 ± 9.13). The pooled estimates of psychological symptoms including somatization, obsession-compulsion, depression, anxiety, hostility, phobic anxiety, and paranoid ideation among doctors were significantly higher than those in the general population (P<0.05). The interpersonal-sensitivity and psychoticism were similar in prevalence to Chinese population norms. Conclusions: There exists varying degree of psychological problems in young doctors. It is necessary to adopt some effective measures actively to improve their psychological health. There is a traditional custom in the universities of China, students make an appoint to get-together 10 years later when they graduate from college. This year is the tenth year after I graduated from Hebei medical university. So we gathered at our Alma Mater in June, 2016. This is a good chance for me to investigate the mental status of the young people after they have worked as doctors for 10 years (Figure 1). 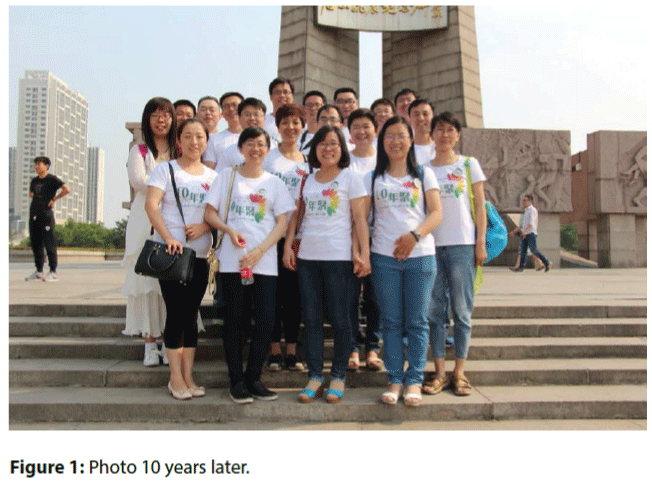 Figure 1: Photo 10 years later. Poor mental health in doctors appears to be a common phenomenon in China . For the medical treatment environment deteriorates in China in recent years , doctors face different kinds of pressure, such as overwork and saving medical expenses for patients because of the large population and the special national conditions. After several continuous “Injury medical incident”, we young doctors feel strongly about the grim situation in our country, which was mentioned in the Editorial of Lancet entitled “Chinese doctors are under threat” . So it is very important to evaluate the mental status of the young doctors. All of the doctors attended the gathering were enrolled in this study. Finally we got 197 pieces of questionnaire. All the doctors worked in clinical office of western medicine including 106 males and 91 females. The age is between 33 and 37 years old with an average of 34. They were all from Hebei province. Written informed consent was obtained from all the doctors. The self-report symptom inventory, Symptom checklist -90 (SCL-90) was used to evaluate the mental status of the doctors. Each item had 5 grade score. No symptoms awarded 1 point; light symptoms, 2 points; moderate, 3 points; a little serious, 4 points; serious ,5 points. The scores of nine factors including somatization, obsession-compulsion, interpersonal-sensitivity, depression, anxiety, hostility, phobic anxiety, paranoid ideation and psychoticism were used to evaluate the mental health status. Testers were required to fill out according to the actual situation in 30 minutes limited. All data were analyzed using SPSS version 18.0 (SPSS Inc., USA). The data were expressed as the means ± standard deviation (SD). Differences were determined using t analysis. A value of P<0.05 was considered statistically significant. The total mean score of the young doctors was 183.7 ± 20.81, which exceeded 160 as the normal boundary. The number of positive items of the young doctors was 37.69 ± 13.17, significantly higher than that of the Chinese population norms (24.91 ± 9.13). For the nine factors, the pooled estimates of psychological symptoms including somatization, obsession-compulsion, depression, anxiety, hostility, phobic anxiety, and paranoid ideation among doctors were significantly higher than those in the general population (P<0.05). The interpersonal-sensitivity and psychoticism were similar in prevalence to Chinese population norms (Table 1, Figure 2). 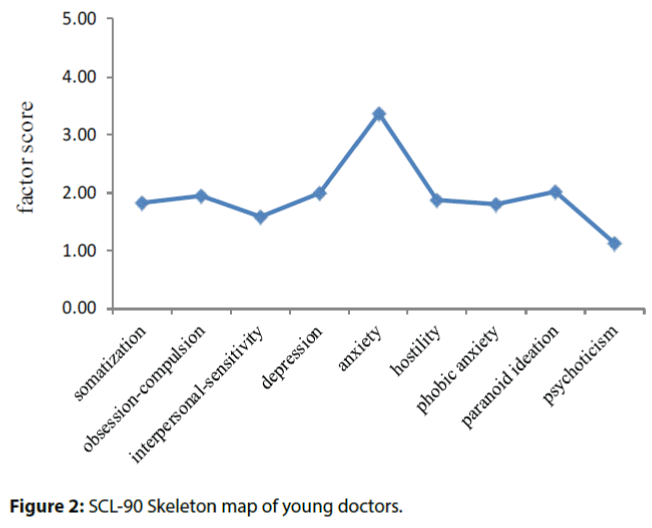 Figure 2: SCL-90 Skeleton map of young doctors. This was the first chance for us to meet with others ten years later since we graduated from medical college. It was a short time for us to chat with each other, recall the past and talk about the future, so we were excited and cherished it very much. During the talking, we found that almost all the doctors were dissatisfied with their jobs. They felt depressed, disappointed with the grim current medical treatment environment. So we decided to evaluate the psychological health status of the young doctors using SCL-90. The results were just as we predicted, the doctors had different kinds of psychological problems, which were also reported in other studies . Seven factors of psychological symptoms including somatization, obsession-compulsion, depression, anxiety, hostility, phobic anxiety, and paranoid ideation among doctors were significantly higher than those in the general population (P<0.05), and the number of positive items was also higher than that of the Chinese population norms (P<0.05). Among the seven factors, anxiety got the highest score than others. As we all know, doctor is a career full of different kinds of pressures including heavy workload, high repeatability, facing with unreasonable patient demands and complaints day and night , updating knowledge, taking countless exams, high professional competence, low salary and so on. This was consistent with previous research report . Recall that in our graduation in 2006, with ambition in mind, we were full of energy and hopes for future and prepared to make a contribution to medical career. However 10 years later, all the things have changed. Pressures coupled with a sense of feeling seriously undervalued by the government and society as a whole; drive several of my classmates out of medicine into other jobs. What is worse, one person has serious depression and needs her family’s care. Injury medical incidents occur continuously in recent years. Innocent doctors or nurses are victims of violence from patients or their family numbers. For many Chinese doctors personal safety is of greater concern. As the article said “Chinese doctors are under threat” published on Lancet, being a doctor has become a dangerous job in China. The causes for the present situation are multiply and complex . China is in a period of social transformation, the policy and system are imperfect. Improper health-care system reforms did not acquire Chinese doctors a deserved improvement in social and economic status. Owing to misleading media reports and public misunderstanding of the medical profession, Chinese doctors have become progressively demonized. In order to improve the doctor-patient relationship, it is essential to take the psychological health of doctors seriously. Psychological counseling may be carried out if needed. Certainly, many other factors can affect the mental status of doctors like marriage, regional disparity. We just did a primary research; in the long run we should do more work on this to change the grim medical treatment environment. Huang Lisu, Zhang Yongjun, Wu Jie, et al.Meta Analysis of Physicians Mental Health Research in China. Med. Philos42(5), 63-64 (2011). Zhang X, Fang P. Job satisfaction of village doctors during the new healthcare reforms in China. Aust Health Rev 40(2), 225-233 (2016). The Lancet. Chinese doctors are under threat.The Lancet376- 657 (2010). Dai Y, Zhang B, Sun H, et al.Prevalence and Correlates of Psychological Symptoms in Chinese Doctors as Measured with the SCL-90-R: A Meta-Analysis. Res.Nurs. Health 38(5), 369-83 (2015). Wada K, Yoshikawa T, Goto T, et al.Association of depression and suicidal ideation with unreasonable patient demands and complaints among Japanese physicians: a national cross-sectional survey. Int. J.Behav. Med18(4), 384-390 (2011). Denton M, Zeytinoglu IU, Davies S, et al.Job stress and job dissatisfaction of home care workers in the context of health care restructuring.Int. J. Health.Serv32(2), 327-357 (2002). Danghui Yu, Tiantian Li. Facing up to the threat in China. The Lancet 376(9755), 1823-1824 (2010).